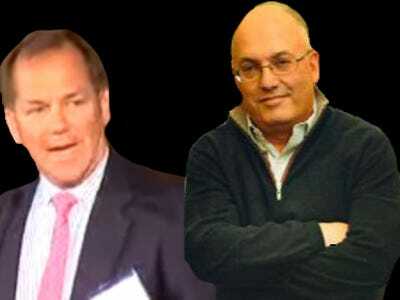 Steve Cohen and Paul Tudor Jones had a fireside chat at the two-day ISI conference at the Waldorf Astoria today. They covered a lot of ground — stock picks, the 90s, Greenmountain, back pain… In fact, pretty much everything except the recent hot water in which Cohen’s hedge fund finds itself because of insider trading-gate, Dealbook reports. Not that that’s surprising, but nonetheless, we’re sure the same thought popped into the heads of everyone who managed to score a seat. Jones, channelling Charlie Rose (his call, not ours), asked Cohen what the biggest mistakes he ever made were. There are two. And one is worse because of the night that followed it. The first was his October 2008 Volkswagen short, in which he lost $250 million in one week. Cohen said it got worse when he came home that night and his wife was orchestrating their Christmas card photograph and made him dress up as the King of Clubs. Sure enough, the picture eventually showed up on the Wall Street blog, Dealbreaker.